Using speech to interact with technology is not only cool but it can also be very productive. It is generally much quicker to record a voice message than write something down or send an email. With that in mind, and the enhanced abilities of Cortana we are seeing in Windows 10, it make sense for all this to connect up to Office 365 as well. To start with you are going to need to have a Windows 10 machine and Cortana already configured on your machine. 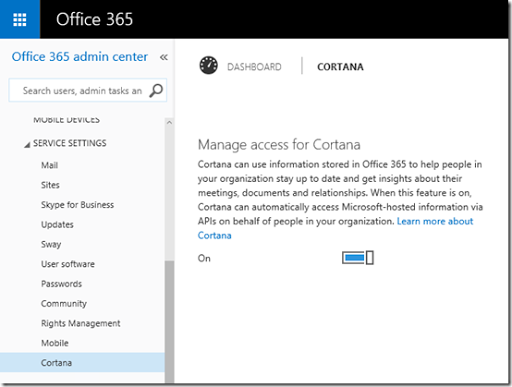 An Office 365 administrator will need to login to the admin center and select Cortana from under the Service Setting on the menu on the left. 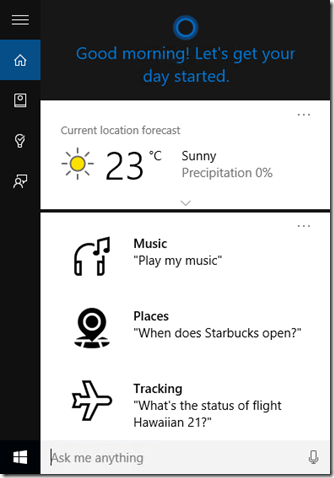 They will then need to ensure that Manage access for Cortana on the right is set to On. On a Windows 10 machine with Cortana already configured simply click into the search box to ‘wake up’ Cortana. Doing so should reveal something like you see above. If you now select the second icon under the hamburger menu on the left (i.e. the one under the Home icon) you should a list of configuration options for Cortana as shown above. From here select the Connected Accounts option. At the moment the only option that is available is Office 365 so select this and set it to On. You should now see the option as On. 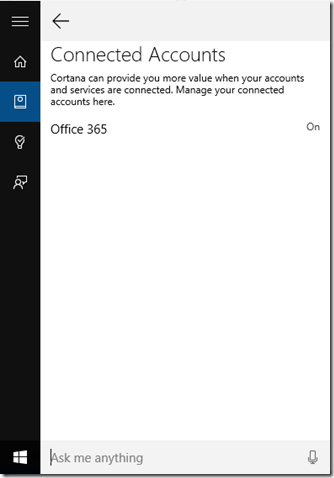 To actually use Cortana with your Office 365 information you’ll need to configure your Office 365 account in both the native Windows 10 email and calendar apps. 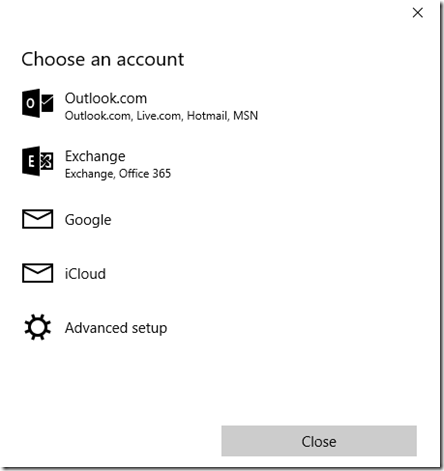 You do this simply by adding the account and selecting the Office 365 option as shown above. With all this connected up Cortana has access to your appointments and will prompt you when meetings are scheduled. You’ll also be able to make appointments and do other helpful things all thanks to the wonders of Cortana. The power and integration of Cortana will continue to grow in both Windows 10 and Office 365, so remember this is still early days. However, I see speech as key technology going forward that is going to make using technology much easier for the average user. 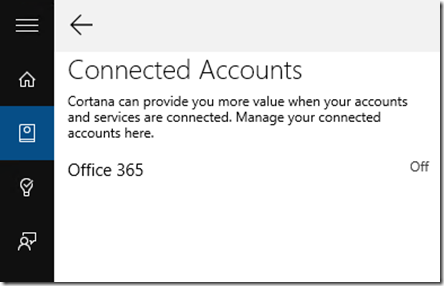 So jump on board today, configure Office 365 with Cortana and prepare for the future. Next Post Are you going to Office 365 Nation?